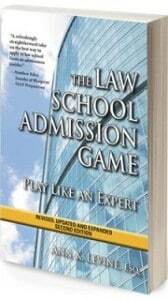 The New, Updated, and Expanded Version of The Law School Admission Game – Released TODAY! Today I released “The Law School Admission Game: Play Like An Expert, Second Edition” – the New, Updated, and Expanded version of the Amazon Bestselling Law School Admission Guide that I wrote in 2009. In this two-part interview by Steve Schwartz: Law School Admission Game by Ann Levine | Interview (part one); Law School Admission Game by Ann Levine | Interview (part two), I discuss some of the updates since 2009. I also gives advice on law school personal statements, waitlists, negotiating scholarships, and choosing schools. For even more details, check out our press release. The book is already moving up the ranks on amazon.com! Get your copy today!